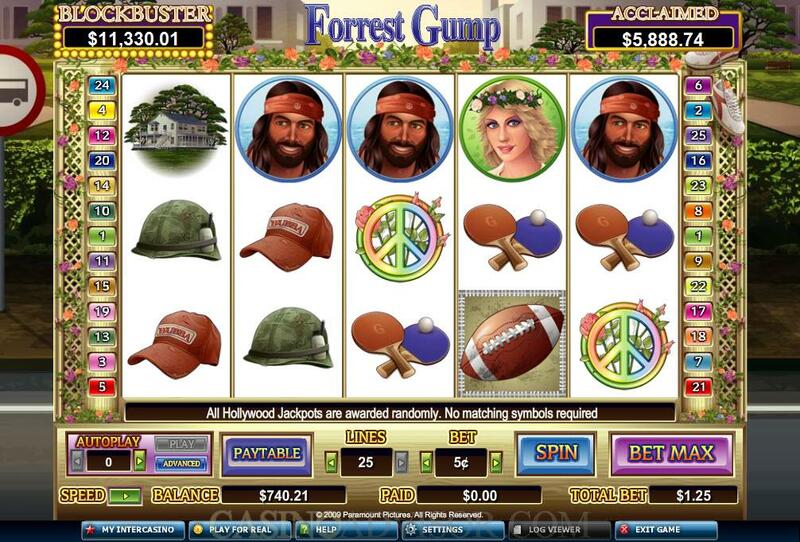 The Forrest Gump online slot game is based on the Paramount Pictures movie of the same name. The slot game recreates the ambience of the movie through exciting audio visuals that will be loved by the fans of the movie. The introductory clip begins with the floating feather, which plays an important role in the movie as a symbol of luck. The introductory clip also shows some scenes from the movies including the famous football scene. The wild symbol is the Forrest Gump Poster and the scatter symbol is the Box of Chocolates. Portraits of Forrest Gump, his girl friend Jenny and army boss Dan Taylor appear as symbols on the reels. The other symbols are also connected with the movie such as Football, Army Helmet and Ping Pong Paddles. 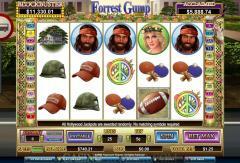 Forrest Gump is a 25 payline slot game from Cryptologic. The coin denomination range varies from 0.01 to 20.00 with a default of one coin being wagered per payline. Forrest Gump Poster is the wild symbol. It appears on Reels 2, 3 and 4 only and acts as a 2x multiplier. The Box of Chocolates is the scatter symbol. Two or more of these appearing anywhere on the reels offer scatter payouts. Three or more scatter symbols trigger the Box of Chocolates Feature, which is a free spins round played on a different set of reels. Five spins are offered as a minimum and the player opens chocolate boxes to win additional free spins. Once the number of free spins is settled the screen changes to a 3 x 3 grid that depicts the inside of a chocolate box. An assortment of chocolates form the symbols and matching chocolates are paid out as per the pay table. 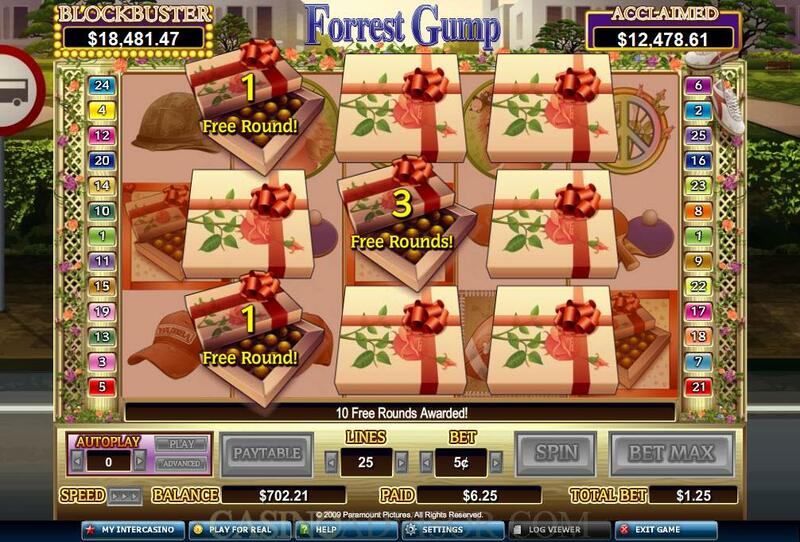 The Run Forrest Run feature is triggered when three or more Football symbols appear left to right on an enabled payline. The player has to click the Run button to start the feature. In the feature Forrest starts running down the football field. The player manipulates the left and right arrow keys to help him dodge tackles from the opponents. A prize is awarded for every 10 yards completed by Forrest without being tackled. Extra credits are offered for making a touchdown. 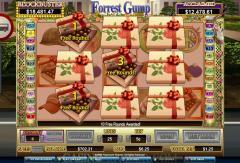 The Forrest Gump slot game is connected to the Hollywood Jackpots progressive jackpots network. This is a five level network in which the jackpots are triggered randomly. The jackpot levels are Smash, Epic, Classic, Acclaimed and Blockbuster. Higher wagers increase the chances of winning the jackpots. Players can make up to four selections to reveal film reels and move up the jackpot ladder. Gold, Silver and Bronze reels award 10, 5 and 3 points respectively increasing the chances of hitting the jackpot. Interested in reading more detailed information about Forrest Gump? If so Click Here for more details.